Red is a stunning statement colour choice, and nothing creates more impact than a red themed kitchen with polished concrete floors. Bright, crisp, clean lines. Smooth, glossy surfaces. 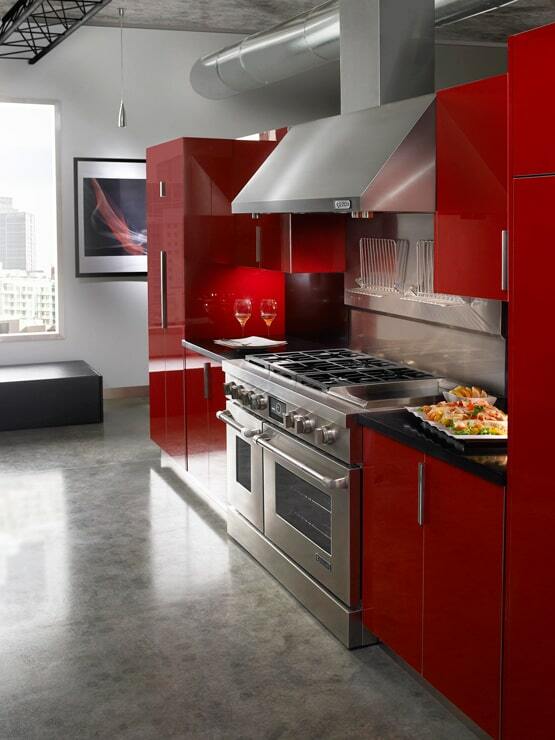 From top to bottom, your red themed kitchen with polished concrete floors is sure to create a wow factor with guests! So, how bold do you want to go? What is your favourite red? If you are looking to build a red themed kitchen with polished concrete floors, we’ve got plenty of great inspiration for you. Bring together the best of the warm and the cool for extra impact. This industrial, apartment-style kitchen features state-of-the-art stainless steel appliances, red gloss cabinets, and striking black benchtops. It is also proof that bold colours can work in small spaces. The polished concrete floors with random exposure add to the warehouse feel, as do the overhead ducts and beams. The simple artwork ties in all the colours of the kitchen without detracting from the statement cabinetry! If you love to cook, you’d certainly love to work in this space! The darker red cabinets have a metallic finish that adds a whole new dimension. Stainless steel accents with loads of light and white benchtops, this kitchen is a dream for any family. The timber finish of the pantry is the perfect way to create an interesting break in colour, and adds warmth to the overall feel of the kitchen. You may not want to leave, and with so much storage space you don’t have to. Choose light to nil exposure for your polished concrete floors, and you’ll have a beautiful floor that lets the kitchen features shine, without competing to be the hero. 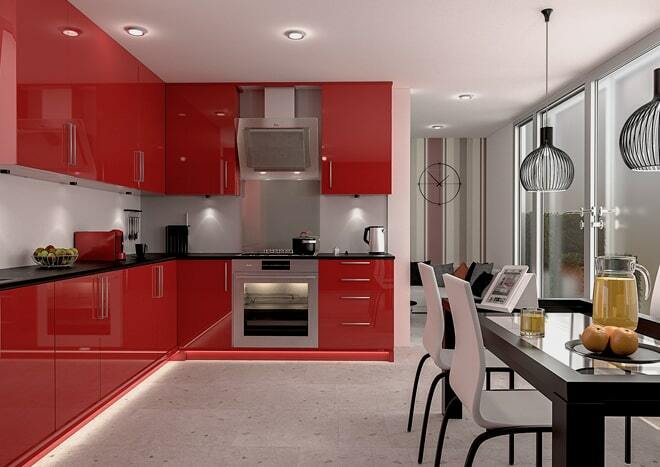 This brilliant red themed kitchen is the perfect candidate for polished concrete floors. It is also a great pick-me-up for anyone who wants to add some energy to their home. The stainless steel appliances and stove splashback compliment the black benchtops and the rest of the splashback, which is a soft, light grey. LED lighting around the kickboards adds to the effect. Light, random exposure polished concrete floors with a matte or semi-gloss finish would be a great base for this red themed kitchen. What if you love red, but you’re not up for red cabinets? 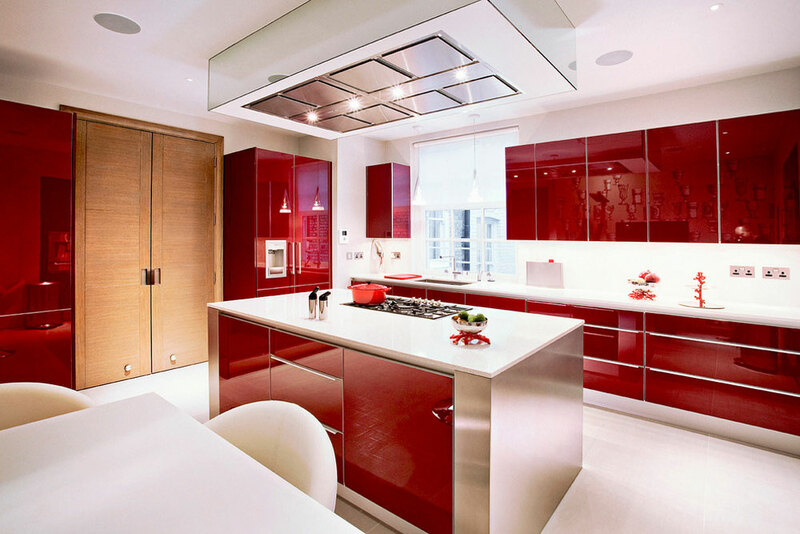 Perhaps your kitchen is already built and you want to bring some red into the mix. Or maybe you prefer something more understated. 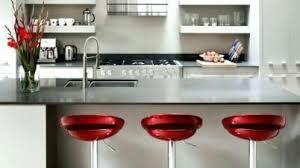 Adding some red stools and decor to your kitchen gives new life – a pop of colour is sometimes all you need. Whatever your style, or whatever shade of red you prefer, red themed kitchens with polished concrete floors really are a great team. At Eco Grind, we are experts in creating beautiful polished concrete floors that will be the envy of family and friends. For an obligation free chat or quote, and to find out more about the benefits of polished concrete, contact Eco Grind on 0439 777 139, or send us a message online.